A delicious Potato Bacon and Cheddar Frittata, that’s hearty enough for dinner, but also perfect for a late weekend breakfast. As I write this today, there are snowflakes falling from the sky. What is with that?! I’m not ready to be done with Fall yet. On the upside though, I guess, it’s hearty skillet breakfast season. This colourful Frittata is loaded with so many flavourful ingredients, it makes it perfect for not only breakfast or brunch, but for a hearty dinner, as well. I love the addition of potatoes to this frittata and it’s even better when those potatoes are crispy and browned in a bit of bacon fat. 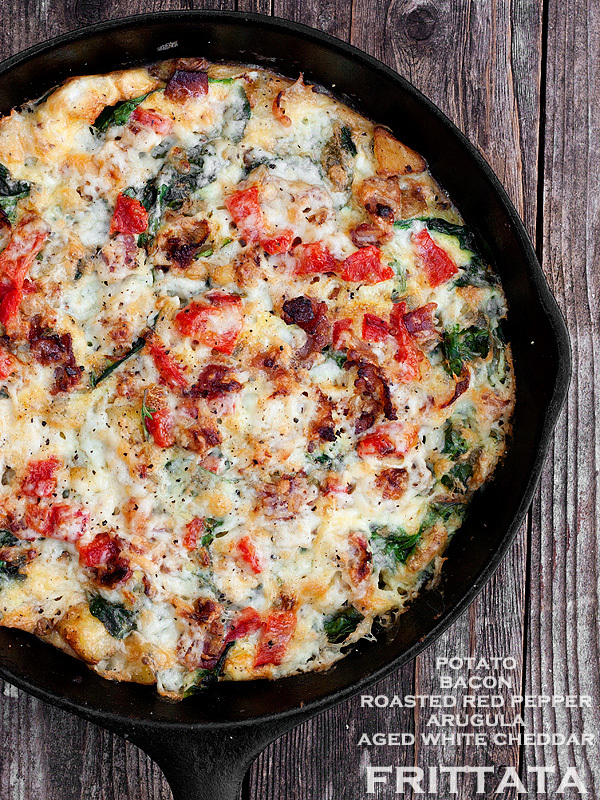 Combined with the greens, roasted red pepper, bacon and cheese, it’s a full breakfast in one skillet. Even my “not really a fan of that whole frittata thing” daughter loved this one. I credit the potatoes, as they really ground this dish, so it’s a bit less of an egg dish. In fact, there is really only enough egg to hold all the ingredients together. You can use any kind of cheese for this one, my only tip is to pick one that’s really full-flavoured, or it will get lost with all the other flavours going on here – a good, aged cheddar, Fontina, Gruyere, Asiago would all be good choices. You can use jarred roasted red peppers or quickly roast your own (instructions below). A delicious breakfast, brunch or dinner frittata, full of flavourful ingredients. Feel free to change it up to your tastes or what you have on hand. The potatoes give a lot of texture and flavour, so I wouldn't skip. Adjust ingredient amounts based on your skillet size. In an 8 or 10 inch cast iron skillet over medium heat, cook diced bacon until browned and almost to crispy. Add onions and continue cooking, stirring, until bacon is cooked and onions are softened. Remove to a paper towel to drain and set aside. Remove all but a couple of tablespoons of the bacon grease. Add the potatoes to the pan and cook, stirring to coat with bacon fat. Add some salt and pepper. Place skillet in the preheated oven and cook, stirring occasionally, until browned and crispy, about 20 minutes or so. Meanwhile, whisk together eggs, Parmesan, 1/4 teaspoon salt, and 1/4 teaspoon pepper in a large bowl. Set aside. Once potatoes are browned, remove from oven, but leave oven on. Evenly scatter the arugula or spinach over the hot potatoes and allow to stand for a few minutes to wilt it slightly. Scatter roasted red pepper and reserved bacon/onion mixture over top as well. Carefully pour the egg mixture evenly over vegetables and top it off with the cheese. Place skillet back in the oven and cook for 4-5 minutes, just to set the eggs. 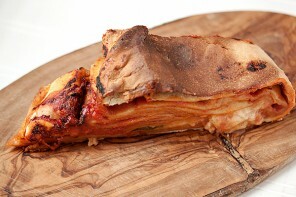 Switch the oven to broil (raising rack if necessarand broil until the cheese is bubbly and browned. *To roast red peppers, slice off sides and place on a baking sheet (skin side uunder a broiler for 10-15 minutes, until softened and well blackened. Remove to a plastic or paper bag. Seal and let stand 10 minutes. Peel off skin and dice. 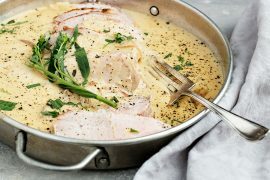 I made your Grilled Pork Tenderloin with Green Curry Sauce when our daughter visited us in Ontario last fall. We returned the favour and are currently visiting she and her husband in British Columbia. So….Kristine planned a special meal for our first night and it was the same dish with the added benefit of organic/heirloom vegetables from her own garden as an accompaniment. Hi Dale and so glad to hear you’re enjoying that dish again. The addition of garden fresh vegetables must have been fantastic. Enjoy your trip! Hi Casey. I think so. Just make sure they’re completely cooked before adding the rest of the ingredients. Hi Jennifer, I love your website and recipes, this frittata recipes sounds amazing, do you know if it is something you can make ahead and reheat? Hi Joan and thanks! I think it would be fine cooked ahead and re-heated. This one’s great for a quick dinner or late breakfast on weekends! Hi Nikki. Any oven-safe skillet (many are) will work. Jennifer….I wouldn’t mind making another one but I’m now down to having a lot of goat cheese in the fridge. Do you think I could use goat cheese?? I think goat cheese would be great in this, Dale. I just made this for lunch for four friends and it was a big hit. We’re staying at my sister’s place for a month or so and I was looking for away to use up a few things before we leave. THEN….when I spotted my brother-in-law’s well-seasoned cast iron pan a lightbulb went off and I looked up this recipe. Good decision. It was delish! Hi Dale! Glad you enjoyed it. It’s a great fridge cleaner and so adaptable to a bunch of different ingredients. So glad you enjoyed it Lana and I think it’s perfect for Christmas morning! This looks so nice, I was out for brunch last week and it got me thinking about trying some new brunch dishes at home – this one will definitely be getting added to the list. Thanks for sharing! We just had our first snowflakes fall here in Indianapolis today. This recipe looks like the perfect combination of savor flavors. Since my husband does the morning cooking, I’m printing this out for him for the weekend. Thanks Angie. Hope you enjoy it. It’s perfect weekend breakfast food, for sure! Hello Brunch Club! This looks awesome! I’m imaginging the crispy potatoes mixed in with all the eggs and melty cheese — delicious! 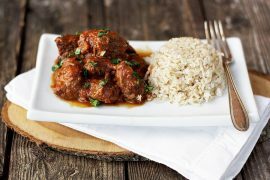 I definitely have to try this Jennifer – so good! Thanks Liz. It’s great for late weekend breakfast. I’m typically in the same frittata camp as your daughter, although I love Spanish tortillas, and the potato and slight egg in this frittata reminds me exactly of that. Plus- an excuse for plenty of cheese! You’re a woman after my own heart, Ruthy, because I’m always looking for ways to use plenty of cheese. I think you’d like this one. 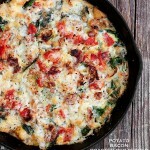 I love a good frittata and yours looks so tasty with all the colors and textures!